Nearly everyone these days has a wheelie bin, and for the most part, they're pretty convenient. Throw your bags in and forget about them! But what happens when not everything goes to plan? If you've been having problems with your wheelie bins, then we've got some solutions for you. 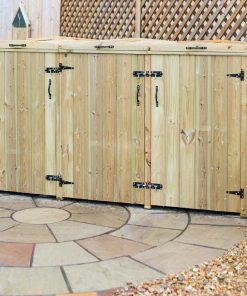 Read on to find the solutions to the most common wheelie bin issues. My Bin Hasn't Been Collected! This is maybe the most common of all wheelie bin problems, and there's nothing worse than finding out that all that rubbish hasn't disappeared after all. There could be several reasons for this. Firstly, do make sure that you're following your pick up schedule. If you put your bins out on the wrong day (or at the wrong time), then there's going to be no one there to pick them up. Secondly, and more likely, councils do tend to be pretty strict about wheelie bin rules. If your rubbish isn't being picked up it's probably because you've broken one of the council rules. Make sure you're only throwing away things that are supposed to go in the bin (so no recycling should be in there, for example). And many councils insist that the wheelie bin lid must be closed and closed properly before it will be picked up (if you have a problem with that, see below “my bin is too small”). Finally, your bin might be too heavy, since many councils have rules about the weight of rubbish they'll pick up in one container. My Bin is Too Small! Wheelie bins actually come in different sizes, so if your bin is too small there's always the option of getting either a bigger one, or a second one. However, you may have to pay for this, depending on your council. Most councils give free bins of certain sizes depending on the size of your household. If you want a larger or second bin you will either need to persuade them that you have special circumstances (for instance, a small child at home in disposable nappies), or you'll need to pay extra. My Bin is Temporarily Too Small! If you're planning on holding a party or event at your home that's likely to produce more than the usual amount of rubbish, then you can arrange for a special pick up of your bins after your party. Most councils charge a small fee for this, but the extra charge is better than finding that your bin isn't picked up at the regular time due to being over weight or the lid not being closed. You can also get special pick up for bulky items that won't fit inside your bin. Wheelie bins are usually pretty rugged, but they do occasionally break. Small damage, such as broken wheels or lids, will usually be fixed free of charge by your local council, so you'll need to contact them. However, if the damage is large and is your fault (due to neglect or misuse) then you may be charged. It's best to contact your council on this one. My Bin is Too Heavy for Me! If for some reason you can't move your bin yourself, perhaps due to injury or age, contact your local council. They will arrange for someone to move the bin for you. Older people should only have to prove their age, but if you're sick you may need a doctor's letter to get you this service free of charge. My Bin Has Been Stolen! Strangely, some people do feel the need to steal bins, but don't worry if you can't find yours. You local council should look into the matter, and will provide you with another bin free of charge as long as they're satisfied that the bin really was stolen. If you live in an area where this is a regular occurrence, then you might want to consider getting a lockable bin store to stop this from happening. If you find that you've been given someone else's bin by mistake, then your best bet is to check around with your neighbours and see if there's been some confusion. If you find a bin that's abandoned or unwanted, call your council and they'll come and pick it up. I Don't Have a Bin! If you're a new resident then contact your council for info on how to get a wheelie bin. However, be aware that wheelie bins are not given to all homes. If your home is on a steep hill, for example, you will likely not be given a bin, or if there is no storage space for the bin around your home. Smaller apartments and sometimes even terraced homes usually have larger shared bins and do not receive individual wheelie bins. I Don't Want a Bin! Unfortunately, if you live in an area where the council has decided to provide wheelie bins, you have little choice in the matter. If you do not use the supplied wheelie bin then your rubbish will not be collected. You are, however, free to dispose of your own rubbish (rather than having council pick up), but most councils will fine customers who allow rubbish to pile up outside their homes. Okay, rubbish smells, but if your bins are getting especially bad you can wash them out. A simple mixture of water and washing up liquid should be fine. 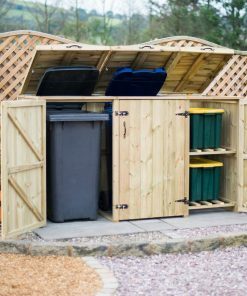 You might also want to consider storing bins in shaded areas, out of direct sunlight, or purchasing a bin store to try and contain the smell a little better. For the most part, problems with your wheelie bins should be solved through your local council. In many cases this can be done online, since most councils have online forms for different kinds of waste management issues. If you have any concerns at all about your bins, check with your council first!